A Ciro Marchetti fantasy image which any puzzler will find an enjoyable challenge. A Ciro Marchetti fantasy image which any puzzler will find an enjoyable challenge. 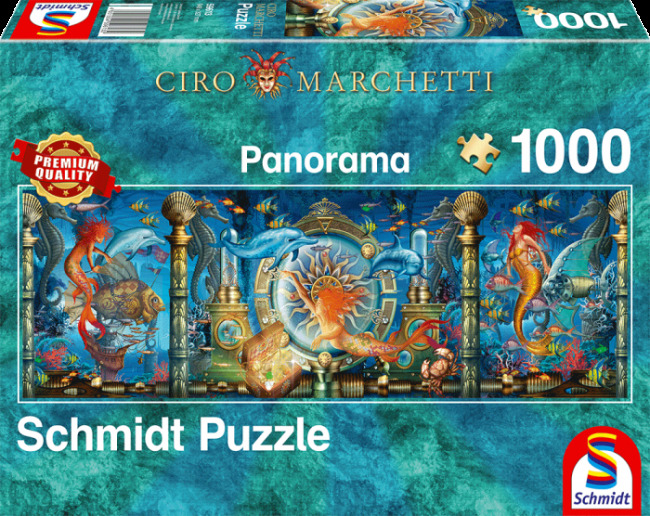 The completed puzzle measures: 948 x 327 mm. Manufactured to Schmidtâ€™s Premium Quality 6 Star-Quality. The 6 unique advantages are: 1. Great variety of forms thanks to individually shaped pieces 2. Perfect cohesion thanks to specially-developed cardboard which is 2.25 mm thick 3. Perfect accuracy of fit thinks to an especially fine punching knife 4. Special matt varnish for jigsaw puzzles without reflections 5. Linen structure 6. 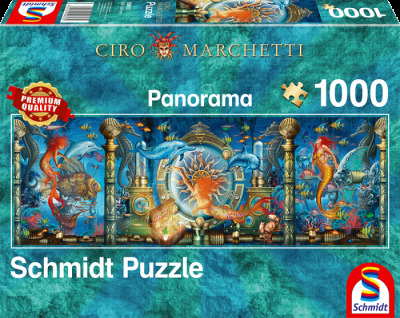 Exclusive design Combined, the quality and fit of Schmidts six star quality means that a 1,000 piece puzzle can be lifted up vertically once complete without the need of any puzzle conserver making this jigsaw a satisfying experience for any puzzle lover.